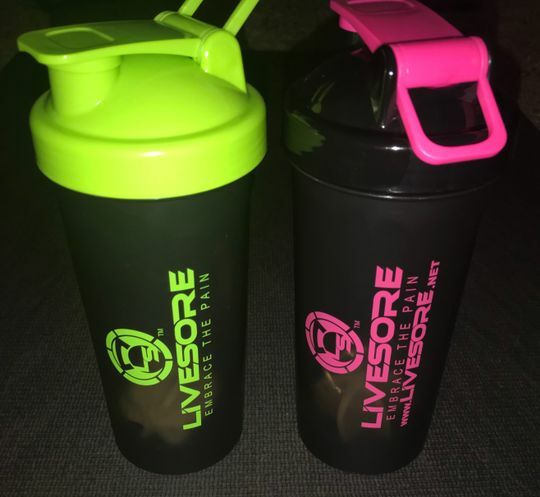 Such a hot combo, the LiveSore Black & Pink Shaker Bottles! The LiveSore custom designed "loop lid" 22oz shakers are the ideal shaker bottle at an incredible price. These bottles are perfect for protein shakes, water, preworkout beverages, and anything else you can think of. They are designed with a super convenient finger hold/loop top so that they are easy to carry and come with the functional mixing ball to help keep things "shaken up". Ideal for protein shakes, smoothies, water, pancake batter, & more – dishwasher safe! Gjnjojo I. Reviewed by Gjnjojo I. Have had a lot of shakers. Usually not very excited about it. My wife has been loving her for just water intake and protein drinks. The rubber mixer inside has good weight and breaks up protein way better than most of the flimsy metal ones. A. W. Reviewed by A. W.
This is a great quality shaker bottle. I have had this one for a year and use it daily. Has held up well and the bold pink design has survived many dishwasher cycles. Thanks so much for the feedback! Love hearing how it holds up with the washes! Love this shaker! It super easy to clean and not have to mess with the wire agitator like other brands.